Absolutely everything you need to know to get started! In this post we are going to talk about EVERYTHING you need to know in order to get started with hand lettering. – all in one place! No matter your skill level or where you are from, this guide will help you understand what hand lettering is and how you can get started with it TODAY! In case you are a more experience hand letterer, you may want to check out the FAQ list at the end where we also mention other more advanced topics. There are so many things to explain and to talk about when it comes to hand lettering, but as a beginner we want to avoid to overwhelm you with a ton of information. Tools for inking – fine liners, markers, pens etc. What style to start with? A free downloadable file that will gradually guide you through your first days of hand lettering. To give you a quick answer – Hand lettering is the art of DRAWING letters in various letter forms, scripts, shapes and sizes. We see waaay to often people using these 2 terms interchangeably and that is simply wrong. Too many bloggers and online articles are writing about brush lettering and referring to it as hand lettering, which just keeps spreading this often misconception. As you can see in the image above, both examples look similar, however, they were created with a different technique. In other words – calligraphy is written and hand lettering is drawn. You can check this article that we recently wrote, where we talk exactly about the difference between hand lettering, calligraphy and typography. We got you covered. Check out this tutorial on brush lettering and on modern calligraphy to get you started. WHAT DO I NEED TO START WITH HAND LETTERING? This is probably one of the most asked question that we get. but remember that there is no tool that will magically improve your skills. Ok, let’s start with some very basic essentials and then we can also mention some great accessorize that will help along the way. Such a basic tool yet so important and versatile. You could say that the pencil is the most important tool for any hand lettering toolbox. The pencil is the first tool you will use for your creations, and you will need mostly for initial sketching and drawing your guidelines. Starting off with the pencil is essential because you can easily delete unwanted lines until the point you are satisfied with your sketch – more on that later when we come to the 6 step lettering process. There are different types of pencils on the market, so let’s have a quick look on what kind of pencil you should get compared to the ones that you should avoid using. The main difference between the types of pencils is the softness or hardness in the lead. A softer lead will leave a darker trace and it will require frequent sharpening while harder leads will leave a lighter trace and will not require to be sharpened as often. At the end of the day if you wish to use a softer pencil give it a go and see for yourself what kind of pencil suits you best. So how do you know which pencil has a softer lead and which one has a harder one? The numbers serve as a scale, for example a 6B is going to leave a darker trace than a 2B. Ok so what pencil should you get for hand lettering? Mechanical pencil – these are probably the best choice, a very solid grip and they also come with a special sharpener that won’t leave any mess on the table. Unlike with calligraphy, hand lettering does not have such strict rules when it comes down to paper. Again, some papers are better than others but the choice here is much broader. 1. Rhodia dot pad – this is a very common and quite popular brand among the lettering community and aside from the quality bleed-proof paper, you have a laid out dot grid on each page that is extremely helpful when it comes to creating consistent letter forms. 2. Canson Watercolor paper – a great choice for laying out a final hand lettered piece. The texture of the watercolor paper really adds up to the whole presentation of your work. 3. Canson mix media pad – if you wish a plain non textured type of paper, the canson mix media pad is definitely your top pick. As the name says, this paper will allow you to use a variety of different tools and it comes at a really affordable cost. 4. Black paper – in case you wish to spice things up and invert your work, you can also check out the black colored paper. Using a white (or light) color will create a very strong and eye catching contrast. If you wish to find out more about the importance of working with the right paper as well as the different kinds of papers (also for brush lettering) you can check out this guide that teach you everything you need to know. Having a ruler is a must for any hand lettering artist. Being able to create guidelines for your work is an essential step for the hand lettering process. Aside from drawing guidelines, having a ruler could come in handy if you have to outline longer straight lines. In the next chapter we are guiding you through the hand lettering process and you will have the opportunity to see the importance of a ruler. What ruler should you get? As long as you can create some straight lines you are good to go, however our recommendation for a ruler definitely goes to the rolling ruler. Like a regular ruler with the exception of having a wheel on the backside, the rolling ruler will allow you to draw straight parallel lines in seconds! Being able to quickly draw a grid for your work will definitely come in handy, and if you can expand your budget just a tiny bit more you should definitely go with a rolling ruler. Im pretty sure it’s pointless to explain the importance of having and using an eraser. Once again like with the other tools that we mentioned so far, there are some erasers that are better than others when it comes to hand lettering. Tombow mono – has a pen like shape with the eraser tip which is great for erasing small lines and details without erasing other lines as well. This will help you keep your work clean and organized which is very helpful especially if you are working with an advanced layout or multiple words. A kneaded eraser – the awesome thing about this eraser is that unlike a regular eraser it won’t leave any small pieces after you erased something on the paper. It works best on lighter pencil marks. Tools for inking – markers, gel pens etc. This is the final essential tool that you will need in order to bring your hand lettering to life. Once you have your pencil sketch ready it’s time to ink your letters. This is a delicate process that requires more time and focus, and it should definitely not be rushed – once you mess it up at this stage there is not much you can do to go back. Sakura Pigma Microns – Probably the best and most used fine tip markers among hand lettering artists all around the world. The Pigma Microns come in a wide choice of sizes, from very fine tips for the smallest details to larger sizes to cover larger areas quickly. Aside from that, microns are known for the quality and long lasting, acid-free ink that will leave consistent lines every time! Sakura is a very known brand among lettering and calligraphy artists, and aside from these amazing fineliners, they also produce a wide variety of brush pens, markers, colors and other high quality stationery products. Uni Pin Fineliner pens – very similar to the Sakura pigma micron and could a great alternative. it seems that the Sakura Pigma microns have a slight advantage here. Best to try for yourself and see which one suits you better. Uni Posca pens – High quality and long lasting markers with a huuuge variety of sizes and colors. Just keep in mind – we mentioned that you have more freedom when it comes to choosing your paper, however, keep in mind that markers with higher ink flow could easily bleed through cheaper paper (like regular copy paper) and ruin your lettering piece – be sure to test it out before! Ok, so now we know what hand lettering is (how it differs from calligraphy) and what we need for it (the essential tools). Now it’s time to see how you can actually start with hand lettering. I don’t want to just tell you the classic ‘’find inspiration and practice’’ story. I believe that as a beginner there is a much more efficient way for you to start and to practice. Before we get down to the practical part i think it’s important that you have at least a basic understanding when it comes to terminology. When it comes down to terminology there are soooo many different terms for absolutely every little detail ever created for letters. As a beginner i really believe that it’s not essential for you to know all of these ( i mean if you want to, good for you :D) instead i want to keep things simple and only mention the essential. Now that we got this covered we can move on to the next step. Even if you are a complete beginner you are probably aware of the fact that there are multiple lettering styles. As i mentioned earlier i would highly recommend that you try them all (with time), but considering that this is a beginners guide we will stick only on 2 different styles. As a beginner you want to avoid the information overload and instead focus on smaller parts first. Aside from being the most common styles they are also pretty simple to learn – which as a beginner is definitely something you should aim for. Once you feel comfortable with these two styles you can start exploring different ones. Don’t worry and most importantly don’t rush! You are here to learn and have fun while you do it. How to start with sans serif letters? Sans serifs are very easy to learn once you learn the basic structure. What characterizes sans serif letters are the straight ending in the letters (no serifs – hence the name sans serif) as well as equal thickness on all of the strokes. The best way is to simply divide the letter in each separate shape. Imagine stacking flat wooden boards on top of each other in order to create a letter. This way it’s much more complicated and harder to end up with a clean shape – flat wooden boards all the way! How to start with script lettering? If you have practiced brush lettering before then script lettering will be very easy for you to understand. The key for learning script lettering is to know where the weight should be added (on which strokes) – if you look at an example of script lettering you will notice that the strokes do not have the same thickness. Stick with one word lettering for now! Now that you understand the basics it’s time to practice! I know that you just want to launch yourself and start creating various quotes with multiple words in it. But hold your horses for now. Crafting hand lettering layouts is something you shouldn’t bother yourself with as a total beginner. First of all you must learn the fundamentals so i highly recommend you practice single words for the first few weeks. Once you feel confident with your sans serifs and your script lettering you can add a second word and play around with basic layouts. How to practice hand lettering? Essentially you can just pick a word and start drawing it, however, im going to share a step-by-step process that will help you create hand lettering artwork with confidence! Remember – Planning in advance and then executing the plan is much more efficient than just launching yourself into action and hope for the best – not only with hand lettering but with pretty much everything in life. Step 1 – what are you going to create? First we need to identify what it is that we want to create. What is the word you want to do? Is it going to be in a script or sans serif style? If this is your very first time i suggest to go with a shorter word, and for the sake of this tutorial i will hand letter the word ‘’Creating’’ in a script style. As a beginner, it’s quite difficult to visualize the concept in your mind. This is exactly why we are hunting online for some inspiration! I personally prefer to gather my inspiration through Pinterest, but basically you can find inspiration from where ever you want – books, signs, product packaging other online resources etc. So, im heading over to pinterest and im searching for ‘’script lettering’’ and im going to pick between 3-5 images that i like. In some cases you can go more than 5 but in order to not get too confused i would stay under that. When i look for my picks im paying attention to the details like first and last letters, ascenders and descenders (remember the terminology part) swashes, ligatures etc. This is probably the most important part of the whole process! In this step you will quickly layout a few ideas that you have without putting too much effort. Think of this step as just laying out your ideas on paper. I would suggest to stick to 3 sketches, but if you really want to go above that try to stay under 5. Three thumbnail sketches is an optimal number because you don’t want to overthink the process too much, and besides that, even the sketch you picked can be modified once you start to refine it. Aside from the funky ligature it is also adding more weight to the right side, and thus balancing out the capital C.
What im going to do now is creating a few guidelines that will help me draw my sketch properly. Im going to have my baseline, x-height, ascender and descender line as well as my angle lines. Remember what we talked about in the core lettering rules? Step 5 – Ink that lettering sketch! We are approaching the final steps in our process, now all it’s left to do is to ink the sketch and add some details to it. If inking seems difficult at first meaning that you are having a hard time keeping straight lines – do not panic! That’s totally normal and it will take some practice before you start feeling more confident with your lines. A quick tip for when you are inking your letters is to push your straight lines and pull when you are doing curved lines. This is just something that works for me and hopefully you will find it helpful as well. Also, first cover the sketch with the fine liner and then fix the details – once everything is black it will be easier for you to see where to fix up the mistakes. Now we are at the final step, here you can play around with some details such as shadow, perspective etc. I’m not going to give you some concrete guidelines here, you can rather experiment and try out new things. It’s totally fine if you like to keep it simple without any additional details. Remember to delete the pencil sketch but only after the ink has totally dried off – in order to avoid any ink smudges on the paper. What is the difference between hand lettering, calligraphy and typography? How can I take proper photos of my lettering artwork? The way you present your lettering has become an essential part especially if you are trying to build an online audience with your creative skills. This is probably one of the most often mistakes we see people do. They spend hours (even days) on creating a lettering piece and then they take a very poor photo of it. We saw so many times small Instagram accounts with just a few hundred followers who started to implement a proper presentation that skyrocketed in a matter of months! I highly suggest you check out this step-by-step tutorial written by Arturo from @argoos.letters on how to properly take photos of your lettering art. 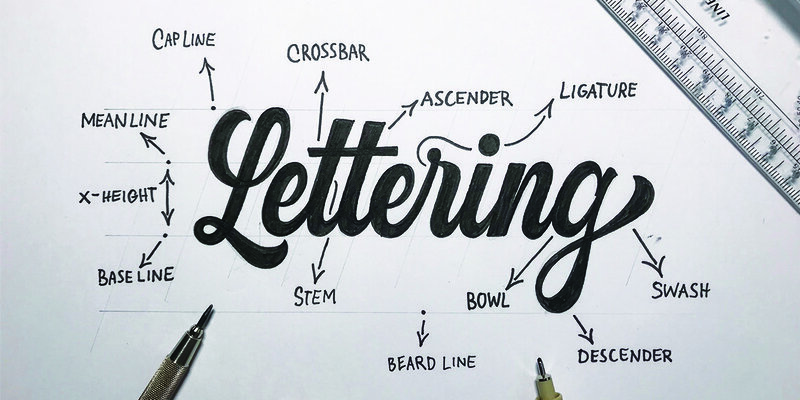 How can I learn different styles of lettering? How can I create good and well balanced lettering layouts? For this topic we actually have 2 separate guides. One was written by Kristen and she guides you through her 5 step process of creating eye-catching lettering layouts. The second one is written by me and it gives you 1 awesome tip that will make the whole topic of lettering compositions much much simpler to understand and execute. How can i properly add colors to my lettering? Colors are a huuuge element not only in lettering but in art in general. As we say it, colors can either make or break your lettering, and this is exactly why we decided to create this article that explains the fundamentals of color theory and how it can be implemented in your lettering. Where can i learn more about brush lettering and modern calligraphy? Here is a step by step tutorial on brush lettering, and here is one on modern calligraphy. The modern calligraphy tutorial will teach you 3 different popular styles – Faux calligraphy, bouncy lettering and distant lettering + it also includes free downloadable practice sheets. How can i efficiently build an Instagram audience with my hand lettering? We have a in depth step by step guide with plenty of actionable steps on how you can grow your Instagram lettering audience. It is written by Scotty Russell from the Perspective Podcast which is one of the best shows for creative people that is filled with a ton of helpful and valuable content! Definitely something to check out. How can i digitize my lettering? Can i take free online courses on various hand lettering and calligraphy topics? What other things could I implement in order to further improve my lettering skills? Beginners should always stick to the basics, but if you are looking to further expand your skills and knowledge about this craft we wrote this article that has some nifty tips and tricks that could give you more ideas on how to improve. What are some cool lettering effects i can add to my artwork? We have an absolutely amazing tutorial for this one! Renee from @simonsaysletter wrote an insane step-by-step tutorial on how anyone can add 5 unique and different lettering effects – definitely a top read! How can i add shadows to my lettering? Adding shadows is an amazing way to add depth to your lettering and make it stand out even more. RK Sanchez from @skribsinner has contributed to the community with an awesome step by step tutorial on 5 different ways you can add shadows to your lettering – check it out here! The 30 day hand lettering planner was created with the purpose of guiding you through your first steps of hand lettering. The 30 day planner is divided in 4 sections (each sections takes 1 week to complete) and the tasks are gradually becoming more advanced and complex. will reflect what we have talked in this guide. The tasks will consist of practicing the basics that we’ve just covered. will introduce you to a new lettering styles as well as the basics of adding colors to your lettering artwork. In week 3 things start to get a bit more interesting. Your focus will be on creating basic layouts (no more than 2-3 words) and adding basic shadows to your lettering. In the last week you will be learning how to properly present your artwork and how to start building your online audience with your artwork. I highly recommend you to join our official Facebook group where you can get constant feedback on your process, ask questions and network with fellow lettering artists. You will also gain access to our exclusive content area, where you will be able to download our other freebies! I hope that you feel at least a bit more confident about your hand lettering after reading this whole guide. I really tried to keep things simple and stick to the very fundamentals while still giving you a general overview of all the important elements. Grab your free copy of the 30 day planner and start practicing every day, and be sure to join our Facebook group so we can connect and we can closely follow your progress. As always, if you have any suggestions, questions or any general comments you are always more than welcome to reach out! I can’t wait to start my 30 day planner. This particular blog not only boosted my confidence but excited me as well. It’s an absolute guide for beginners like me. Thank you !! Love this article & blog. It’s an amazing world we live in with blogs and so much information we can find, from blogs and *free* tutorials like this! 😉 Thanks for sharing your skills. Hi, just joined and I am an absolute beginner. Can I dowload the Ultimate Hand Lettering Guide? I can’t see a pdf link. I will certainly use your club. After searching the net for hours, you seem to be the best!!! I’ll soon start feebly attempting my Calligraphy efforts. All you need to do is drop your email, and we will send you an invitation to our exclusive content area where you can find the 30 day planner along with our other free downloadable content. Loved the article. It’s simple, concise and up to the point. Learnt a lot.